I started using Facebook in 2004 while I was a graduate student at Stanford. As I moved on to work at Microsoft and Google, moving from city to city, I began to rely more heavily on Facebook to keep in touch with my friends and colleagues. Many businesses use Customer Relationship Management (CRM) software to manage their customer contacts and improve sales. I realized that Facebook was becoming my personal CRM– increasingly, it is how individuals like you and me manage and maintain relationships across our personal and professionals lives. Unlike several of the analysts out their talking about Social Media, and Social CRM - Clara Shih is a natural Social Media enthusiast who has managed to become an expert in her field. Be sure to purchase her book if your interested in launching Social Media for your business. 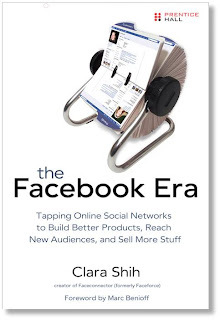 I just finished reading it myself, and find it to be a must have if your in the Social Media or CRM business.